When Is Disruptive Innovation Coming to Cruising? Besides, if you were to drop much of the business "science" that exists behind this concept, you might be inclined to think that it happens regularly. But of course, you would be wrong. And while the idea of something uniquely special creating a new market has fundamental appeal to it, the reality of this in business markets is harder to isolate. Which is why even the man who coined the term, Clayton Christensen, argues that Uber is not disruptive yet Netflix is. Go figure. Recognized in every anchorage, the Nordhavn 46 was the jewel of many dreamers who wanted to sail the world. It still is. Without thinking too hard on it, I might be inclined to make a case that the Nordhavn 46 was a disruptive innovation bringing us a production passagemaker that brought ocean voyaging under power to our cruising community. There were, of course, highly specialized offshore boats before the Nordhavn, such as Beebe's own Passagemaker, but these true offshore cruisers were few and far between, and not exactly a common sight on the trawler docks at boat shows for purchase at the show-only price. You might consider these early capable cruisers as similar to the introduction of the automobile, which also was not a disruptive innovation in itself, as early cars were an oddity driven by the rich, but existed just fine alongside horses and carriages for years without igniting a firestorm of change. But when Henry Ford created the Model T, the world's first mass-produced automobile, that changed everything. Henry offered the automobile to the world at a price that many thousands could afford. And that was the disruptive innovation that changed the world. In the boating and cruising world, we don't see this kind of change very often. Wood boats existed for centuries, and when fiberglass boats splashed in greater numbers in the 1960s, they eventually took over as the predominant boat building material. While some might argue it fits the term, I don't know if it was particularly disruptive. Perhaps. The fact that old wood boats eventually die and go away, while old fiberglass boats don't, is a discussion for another time. When we started PassageMaker Magazine in 1995, the bullseye of our trawler market was the Grand Banks 42 Classic. Every other trawler yacht and/or cruising motorboat got compared to the GB42, which to many represented the ideal serious coastal cruising trawler for a couple. Dependable Diesel Cruiser...damn straight. It did it all, was comfortable and capable, and superbly built. The Grand Banks 42 Classic remained the standard for cruising trawlers for several decades, and it deserved that honor. Great boat. Sustaining technology is the term for continued incremental improvements in the market over time, and that is precisely what has happened to sail and power boats in the decades since. We see less external teak brightwork, more efficient engines and running gear that run cleaner and use less fuel, easier to handle sailing rigs, better wiring and construction practices and materials, and much more ergonomic interiors. Many trawler builders continue to tweak the original Grand Banks recipe, except, sadly, Grand Banks, which went off in a different direction. A Heritage EU or SX...what's with the Harley Davidson jargon? 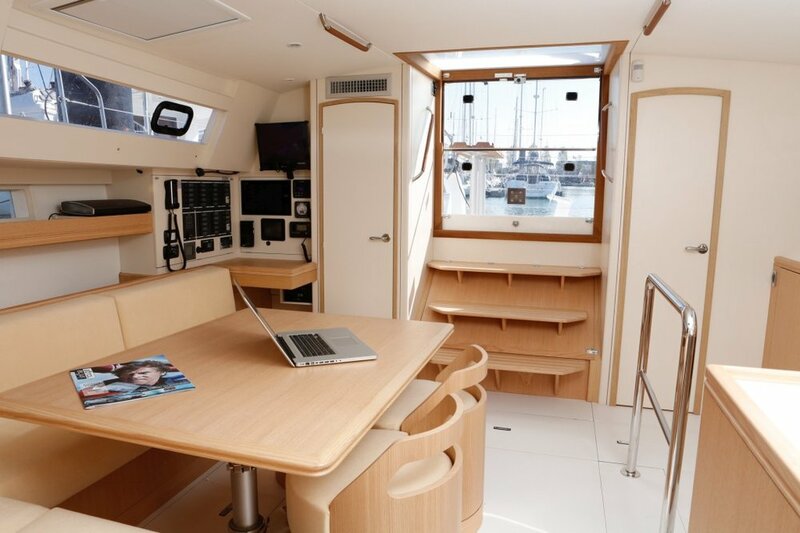 The interior of the new Alubat Ovni Evolution 52 is contemporary and so livable. It is appealing on many levels and guess what...it's a sailboat! Now it is 2017, and I believe the time is right for something new. I find many of the world's accomplished sailors are aging, and talking of inside steering protection, and ease of handling. The tough sell of sailing an open boat is getting harder for some of these old salts, who have done their time in miserable conditions, cold and wet, and living in foul weather gear. At this age, where is the romance of that? The joy of sailing is still there, but can we please make it more comfortable and easier? We could use some disruptive innovation to shake things up in the world of cruising, bringing options to the moms and pops (and younger families) who still want to be on the water, and I am ready for that. For one thing, this cruising thing has gotten way too expensive, frightfully so. When I see a new boat "test" of a new cruising sail or powerboat that is kind of cool but realistically costs well over six figures, my eyes glaze over. That is not what we need right now. Why do we still lust after conveniences and accommodations we frankly can live without? I would honestly prefer some alternatives and options that bring me back to basics and essentials, especially if by choosing efficiency and technology we lower our carbon footprint from thousands of gallons to hundreds, and brings us closer in touch to an environmental awareness once we're out there. The amount of plastic and garbage in the world's oceans is very disturbing, and only a fool still blames it on the Japanese tsunami. I am ready for such innovation and change, and I suspect when it comes it might even blur the boundaries of power and sail, with something that is both...or neither. We will have to wait and see...for awhile anyway.